Beautiful egg objects await discovery. Artists show their egg-artworks with different techniques. Tue-Sat 10 a.m. -5 p.m., Sun and public holidays 11 a.m. -5 p.m.
50 artists coming from Germany, France, Switzerland, the Netherlands, Hungary and Russia. More than 180 artisans, freelance artists and experienced hobbyists present over 11,000 jewelery eggs, which are decorated with a variety of motifs and colorfully decorated. With children’s program and cafeteria. Sat 11 a.m.-6 p.m., Sun 11 a.m.-5 p.m. The Easter Market on Nuremberg’s Main Market Square is the first market event of the year and is the oldest market in the city. 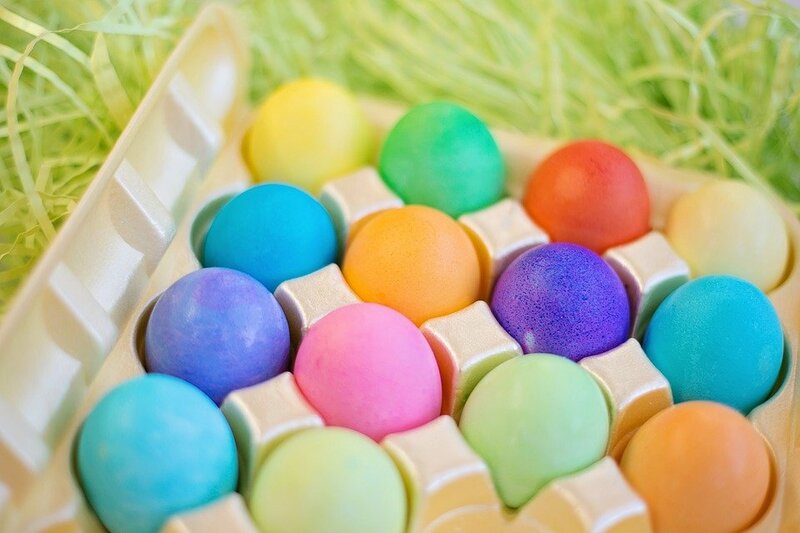 You’ll find Easter decorations, floral arrangements and ceramics, and colorful or traditionally painted Easter eggs. In front of Nuremberg’s city hall, you’ll find booths from artists and craftsmen, plus an array of food booths with sweets, and beverages. The market bread shop hosts cooking demonstrations. Nuremberg is easy to reach by public transit or car from Stuttgart for a weekend or full day trip. Around 40 artisans from the region present their work around the topics of spring and Easter. The range of crafts and home-made products spans everything from pottery, sewing, jewelry, floristry and felting to decoration, patchwork, paper works and wooden objects. Of course, there is also a large selection of painted or otherwise artistically designed Easter eggs. The traders decorate particularly atmospheric on the theme of “Easter”. Many craftsmen offer high-quality goods in the cozy alleyways. Also open Sunday (1-6 p.m.). Wine and sparkling wine with small exhibition. Catering with onion and potato cake. Activities for the whole family offering a petting zoo with real palms and Easter bunnies in the castle courtyard. Creative workshop and fairy tales. Children bake funny easter bunnies in the baking workshop and become little artisans in the creative workshop. The traditional arts and crafts market and cafe is fun for kids and adults alike. Sun, 10 a.m. -6 p.m. The Tuttlinger Ostermarkt offers wares from local artisans to browse and shop. There are plenty of handmade, individual things to admire. Easter activities and decorations make for a great day to stroll through downtown historic Ravensburg. In the heart of old city, two Easter and Spring markets feature exhibitors with original and authentic products; Plants, beauty products, jewelry, toys, tableware and ceramics … as well as numerous Alsatian specialities, fine wines, March beers, charcuterie, cheeses and many other delights which make your taste-buds go crazy! For this Easter weekend, you cannot avoid the rabbits and the chocolate eggs as well as the traditional Lamala (in Alsace means “Easter lamb” – a traditional cake made in a lamb-shaped mould). Fun street events and craft exhibitions are throughout the city to celebrate the return of spring.